We seem to have stumbled on a theme this week: drugs, drugs, drugs. 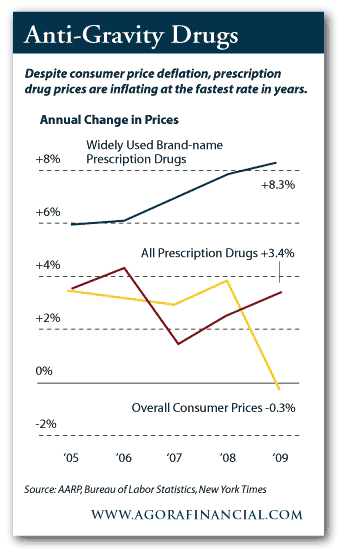 In spite of the “deflation” that has much of the banking world spooked, brand-name drug prices increased 8.3% in 2009, says a study AARP released this morning. They’ve nearly doubled in the past five years. AARP tracked the prices of the 217 drugs most commonly used by elderly Americans and found last year had the highest rate of inflation since at least 2006, when the Medicare drug benefit kicked in. Just in time, a federal judge in South Carolina put the kibosh on President Obama’s plan to allow federal funding for embryonic stem cell research. Fortunately, “the ruling will have little impact on private companies that have been living with the ban on the use of federal funding for unapproved embryonic stem cell lines for years,” says Patrick Cox, editor of Breakthrough Technology Alert and in whose wheelhouse this bit of the news cycle firmly resides. “Primarily, the ban will effect academic institutions that accept federal research money, which counts for a very small fraction of the money that has gone into stem cell research. “And ironically, the biggest impact will be felt by important universities. They’ll no longer be able to profit from collaborations that produce marketable technologies. Today, these collaboration incomes are a significant source of funding for many academic research labs. And ultimately, it will slow the progress of regenerative medicine. “But assuming it stands, the ban will concentrate stem cell IP in private firms that are unaffected by the ruling,” which could be good for investors in the right companies. Already, one of Patrick’s leading stem cell research companies has launched an operation in China, because the regulatory environment there is in many ways more lenient. “Whereas our FDA often acts to protect established pharma interests,” says Patrick, “Asian authorities are consciously attempting to establish new medical industries to compete with American companies and technologies.